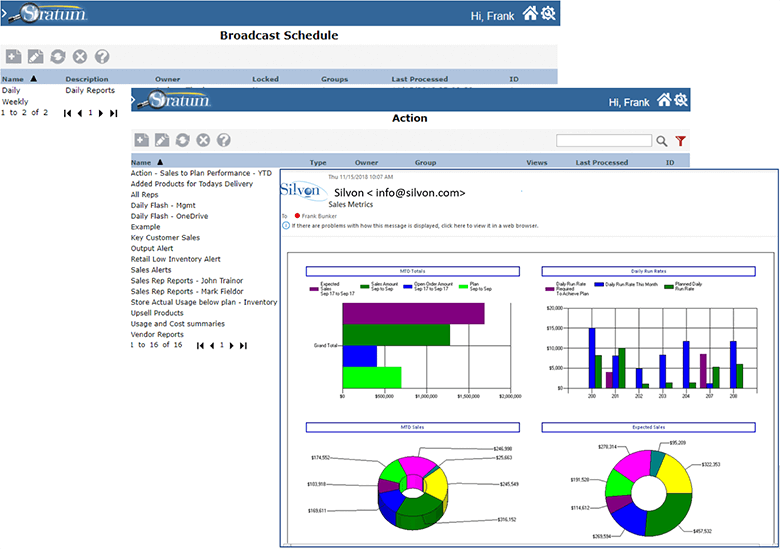 Stratum Broadcast Server streamlines the distribution of repetitive reports to multiple people and is an add-on solution to the Stratum business intelligence software suite. Building on the existing information distribution features of Stratum Viewer, Stratum Broadcast Server enables users to schedule and send existing Stratum views of information to other users without having to rely on their IT staffs to do so for them. When might you use Stratum Broadcast Server? To send a Daily Flash report to Management with key performance information and metrics. To send a single email every morning with the most current open order and sales exceptions to multiple sales and operations staff. To distribute weekly sales reports to distributors, making sure that each gets only their data. To provide brand managers with a glimpse into daily sales or revenue-to-date every morning. To proactively notify your Inventory Control team of potential out of-stock conditions. There’s even functionality for broadcasting (or moving) large sets of data from Stratum to Excel for use in other tools and corporate systems. CONTACT US for more information about Stratum Broadcast Server or your FREE trial! The premise behind Stratum Broadcast Server is quite simple, yet unbelievably powerful! First, a user creates what is called an Action Definition. This consists of WHAT the user wants to send, to WHOM they want to send it, and HOW. Then, a Broadcast Schedule is created for when and how often the report should be processed and sent. Report content can be made up of multiple Stratum views. Multiple reports can be combined into a single deliverable such as an Executive Daily Flash packet. Stratum Broadcast Server also lets you distribute alerts and notifications with ease. These alerts contain analytical views of supporting data so users can easily view and take action on critical issues or link to current information for further investigation. Distribution groups are supported with the ability to mix and match groups for added flexibility during the report distribution process. Stratum Broadcast Server lets you take advantage of the security that has already been set up in Stratum related to users and roles. Reports only show content permitted by a recipient’s Stratum security. Reports can even go to individuals external to your organization thanks to a special ‘broadcast user’ only classification which also operates under the umbrella of Stratum security. This feature is helpful, for example, when you need to send reports to distributors or external sales consultants. 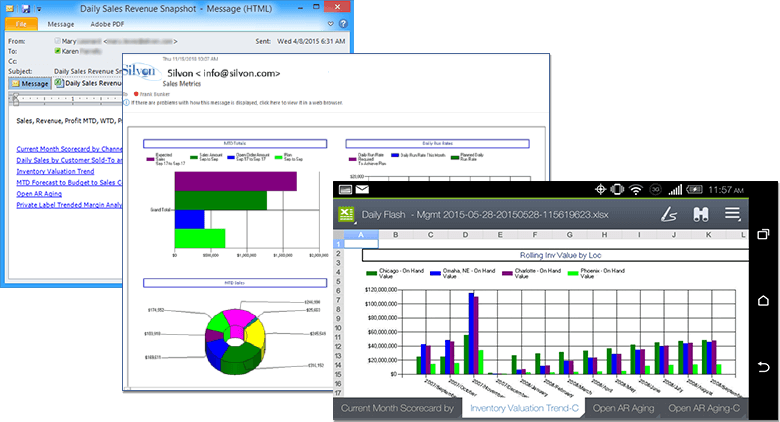 Stratum views of information can be delivered via email in a single Excel file. Files can also be distributed to network folders or to the cloud for easy access from anywhere on any device. Reports can be scheduled for immediate distribution or for nightly, weekly, monthly, etc. delivery on a regular or one-time basis. Users can schedule their own actions. They can remove or reassign actions to different schedules as their needs change. Administrative controls are available to limit a user’s access to schedules; administrative-level control by IT is supported as well. As Stratum.Broadcast Server users build out a reporting pipeline, it’s easy for them to keep tabs on it from a few key windows in your Stratum implementation. They can add and remove reports, update content and delivery methods, and reconfigure processing groups and schedules at any point, without having to call upon IT resources for assistance. Here, a Stratum view of data is included in the body of the email – in this case, showing sales to forecast, open orders and required run rates to meet the plan. In this particular example, there are links in an email to live daily reports, and the attachment packages data into the convenience of a single Excel file. Managers can simply tab through the file from their PCs, laptops, tablets or mobile phones to view the information they need. Should you prefer that certain reports be written to a network location or your company’s cloud instead of distributed by email, Stratum Broadcast Server can handle that for you, too. For example, in the email to the right is a set of reports that a user scheduled to run every week and send out as an alert to various individuals and groups of users. The reports are written to a shared folder (in this case, on OneDrive). An email tells recipients when reports are ready and provides links to them regardless if they are written to a network location or company cloud.